When it comes to land in Mississippi, Tom Smith is the man. After all, he is known throughout the area as “The Land Man” because he’s the only local real estate professional who focuses solely on the land market. Whether you are an investor seeking timber sales, a developer or simply an outdoor enthusiast like Tom who wants to have an unspoiled property to escape to on weekends, “The Land Man” is the one to know. He’s an Accredited Land Consultant (ALC) with incredible business savvy and specialized knowledge. 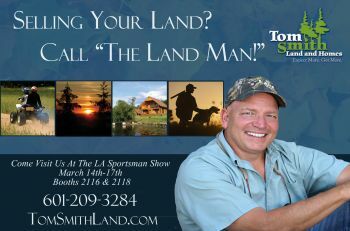 Tom will help you make the most of your opportunities in the Mississippi land market, so call him today. Tom proudly serves the needs of buyers, investors and sellers throughout the state of Mississippi! To see all the properties available, click Land for Sale above.